Having a title that is fun to say is just one of the amazing things about this masterpiece. Das Boot is a German film from 1982 ostensibly about a German submarine crew and their experience in the ‘Battle of the Atlantic’ in WWII. I understand that this film can seem like a chore since it is 3 and a half hours, has subtitles and takes place in pretty much just one location (the sub). Yet I argue that these are the very things that make it amazing. The film does not feel overly long, in fact, the running time just makes the movie into an epic adventure and the time just flies by. There are too many movies that look on WWII from the British or American side, but this German outlook is a fresh point of view. But the best part about this film, and for me is the biggest selling point, is the limited storytelling. We never see any of the enemies directly since it takes place in the confines of a claustrophobic submarine set. You feel tight of breath while watching the poor men survive in this hunk of metal. Tension is constantly ramping up during every attack and this is supported by a very sparse score coupled with an incredibly detailed sound design. I will admit that the weakest part of the film is the score, since it evokes all that is horrible about 80s music (similar to the cheesy parts of the Rocky scores). The film takes a firm stance on anti-war, since most of the men on the boat serve little loyalty to the Nazi regime. You will certainly feel shocked and devastated by the end of the film. I can find amazing things in nearly every scene; whether it’s the sound effects, the long takes, the character motivations or the intensity. When a battle or thrilling scene ends, it is only after that you realize how invested in that scene you were when you finally breathe again. There is a moment later on when the submarine emerges from the deep and they open their hatch to fresh air. When that hatch opens, you are gasping for air along with everyone on screen. Summary: The movie has an easy-to-follow plot and a straightforward narrative with a simple message. The music (if present at all) can get a little cheesy, and some blue screen shots were clearly made on a tight budget, but these flaws are forgivable. If you can give this film your undivided attention and watch it on a big screen with big sound, you will not be disappointed. 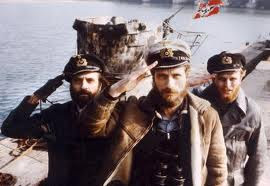 Das Boot is one of the best films I have ever seen, it will captivate you and put you right in the action. It is my #21 favourite movie of all time. P.S. It is currently available on Netflix, and I would recommend the Director’s Cut.